Friday, January 25, 2019 – BMO Harris Bank Center, Rockford, Ill. 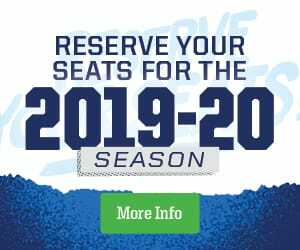 The Manitoba Moose (19-18-3-2) suffered a 4-3 shootout loss to the Rockford IceHogs (18-19-3-5) at BMO Harris Bank Center on Friday night. The Moose weathered an early storm from the IceHogs, getting some help from their goaltender, as Eric Comrie made 12 saves in the period. The Moose were awarded two power plays in the frame, and made good on their second chance. Seth Griffith held the puck below the goal line until a lane opened up to move the puck to Marko Dano. He snapped it past Kevin Lankinen to open the scoring with 2:50 left in the frame. That marker stood as the only tally as Manitoba took a 1-0 lead into the second period. Manitoba added to the lead 2:56 into the frame when Sami Niku jumped into the rush and tipped a Kristian Reichel pass to the back of the net. Rockford got on the board at 11:33 with a power play goal from Luke Johnson as he ripped a shot by Comrie. The Moose goaltender rebounded quickly, coming up with a brilliant, lunging glove save to keep Manitoba in front just moments later. Manitoba restored the two-goal edge with a power play tally of their own. After a Griffith shot was knocked down in front, JC Lipon put a nifty backhand feed over to Michael Spacek, who deposited the puck in a mostly empty net. That goal left the Moose in front 3-1 through two frames. 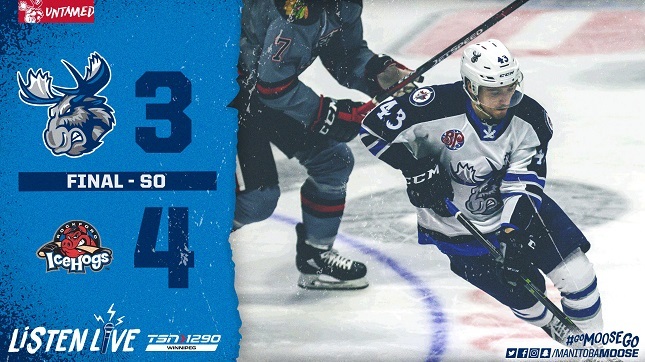 The Moose looked to be headed to their 20th victory of the season, but Rockford started a comeback with two minutes left. Dylan Sikura’s long shot found the back of the net to get the home side within one. A minute after Logan Shaw’s long clearing attempt hit the post instead of the empty net, the IceHogs pulled even. A faceoff win for Rockford quickly found its way to Jordan Schroeder for a one-timer to tie the game 3-3 with three seconds remaining. The Moose nearly walked away as overtime winners, but Niku’s one-timer in the extra frame was turned away by Lankinen. The IceHogs scored on both of their attempts in the shootout, while the Moose came up empty in the extra shots to fall 4-3. The Moose pushed their point streak to nine games (6-0-1-2). Seth Griffith has points in eight straight games with 12 points (1G, 11A) in that span. Sami Niku has points in four straight AHL games with five points (1G, 4A) in that stretch. The Moose face the Milwaukee Admirals with plenty on the line Saturday at 1 p.m. CT. Tune into the key divisional matchup on TSN 1290, moosehockey.com/listenlive and the Moose App, or stream with AHLTV, beginning at 12:45 p.m. CT.